It all started with a visit to St. Louis last summer to stay with my friend, Sandy. After catching up on our lives and other news, she posed what I thought was an innocent question, but turned out to be anything but. “So, have you been doing any quilting lately?” she asked. “Yes, I just finished a large quilt for my bed,” I replied, not seeing the “Danger, Will Robinson” signs screaming all around me in flashing neon. It was game over at that point. She had me, and there was no getting out of it. Since I was a guest in her home, I could hardly refuse, especially when I couldn’t come up with a good reason fast enough after saying I’d just finished something. Sandy didn’t give me any direction other than to make it modern in style. So far, so good. But she only gave me four pieces of fabric, two of which were practically the same, and I was determined to make something that I could finish quickly using only those four. Enter Pinterest. 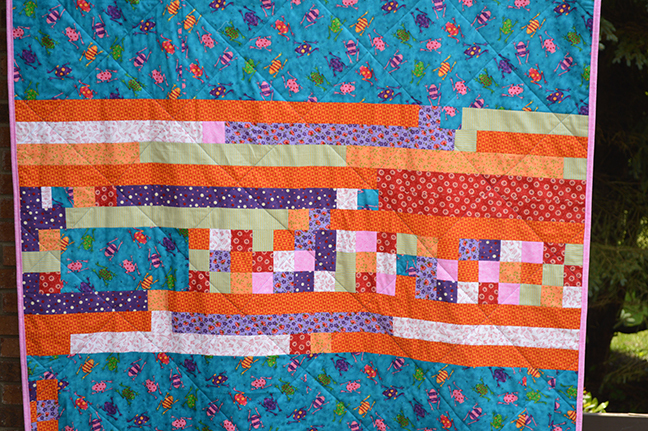 I remembered seeing a number of holiday quilts that used strips and half-square triangles to create blocks that looked like wrapped presents. I then went to InDesign and drew the blocks so I could determine the best proportions, ones that I could use with my Accuquilt Go! Cutter to speed things even further. Each present block finishes at 9×12 inches. The strips are 1 inch finished and the half-square triangles are 2 inches finished. The blocks came together pretty quickly, which I followed up with some basic stipplin after outlining the ribbon and bow. Then I used the alternate striped print for the binding, which is my favorite part of the whole thing. I’ll admit, I grumbled a bit while working on this. 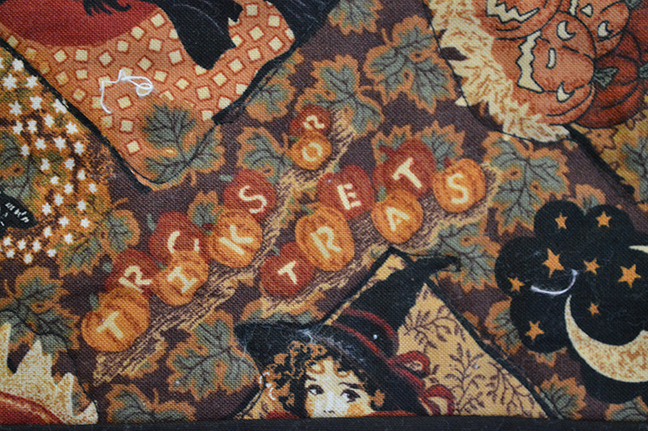 But, the good news is Vee loved the tablerunner, and I got a great design for a runner of my own. First, my finished cover for my Quilter’s Planner 2016. When you purchased the planner, you received instructions for how to make a quilted cover. I decided to to for a scrappy look with some fabric from one of my very first quilts. I didn’t put the zippered pocket on the cover because to be completely honest, I haven’t gotten over my fear of zippers, but hope to conquer that sometime soon, and because I just didn’t think I’d use it, so why put myself through the trouble. I actually like the flat look, and it’s nice not to have to break up the angel fabric at a point where it was interesting. Needless to say, that’s the block I designed (complete with tutorial) on the open page in June. Next up, two pillowcases for the daughters of some good friends. The first, black and white graphic with a pop of red on the inside. 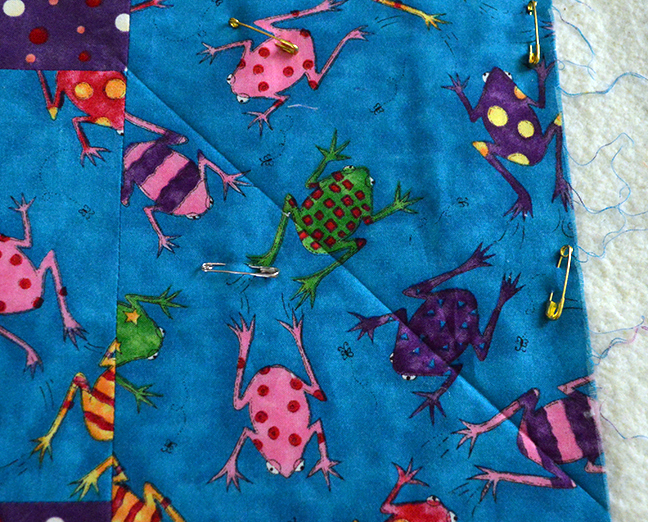 The second features fabric from a pen pal in Australia. How can you not love the duck-billed platypuses and the roos? I finished this quilt — at long last — a few weeks ago, but for a variety of reasons wasn’t able to get photos until last Sunday. A drained battery led to a long nap, so I didn’t take these until late afternoon, catching the golden-hour light photographers love. I can see why they do. Even with my limited skills and the fact that I shot in a somewhat somnambulant state, the colors in these photos are probably the most accurate I’ve ever gotten with Lola (my Nikon D3200). I still need to work on my compositional skills, but hey, one thing at a time. 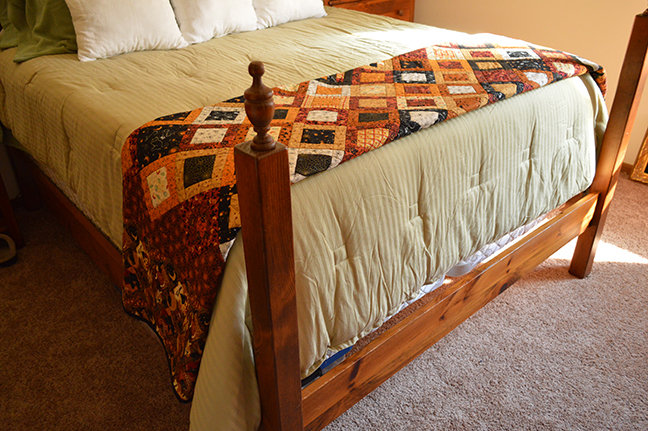 After 10-plus years of quilting, this is the first one I’ve ever made that was large enough for my queen-sized bed. The drop from the top of the mattress to the frame is long, and any quilt has to be at least 108-inches wide, before washing, to cover everything. Each block of the plus signs is six inches finished — a wonderful size for showing off large scale prints and leaving room for plenty of variety. 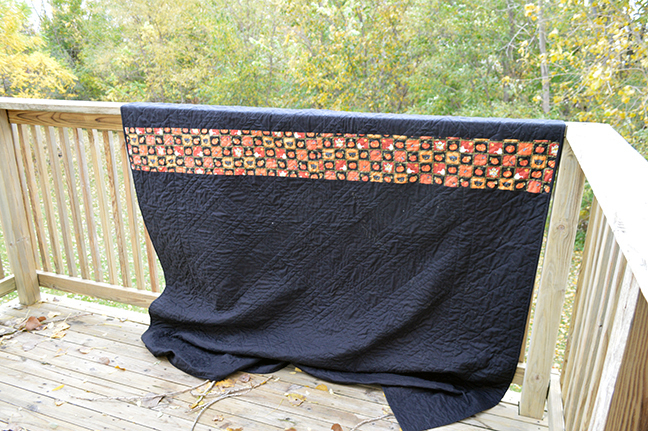 Since its completion, I’ve washed the quilt once, and while the shrinkage was minimal, the red dye ran, even though I used three color-catchers. Thankfully, the color ran pretty evenly, and only on the black/tan bird toile, turning it kind of a mauve color. I prefer the original tan, but at least it doesn’t look too out of place. Maybe it will come out with future washings. The experience has definitely inched me closer to the pre-wash club. Though it’s far from perfect, and it took forever, I love how the straight-line quilting turned out. So clean and simple, and a great choice for a such a busy look. But here’s the thing. While I’m very happy to have a quilt that fits my bed and certainly glad to have another finish, overall, I’m not really that keen on this quilt. 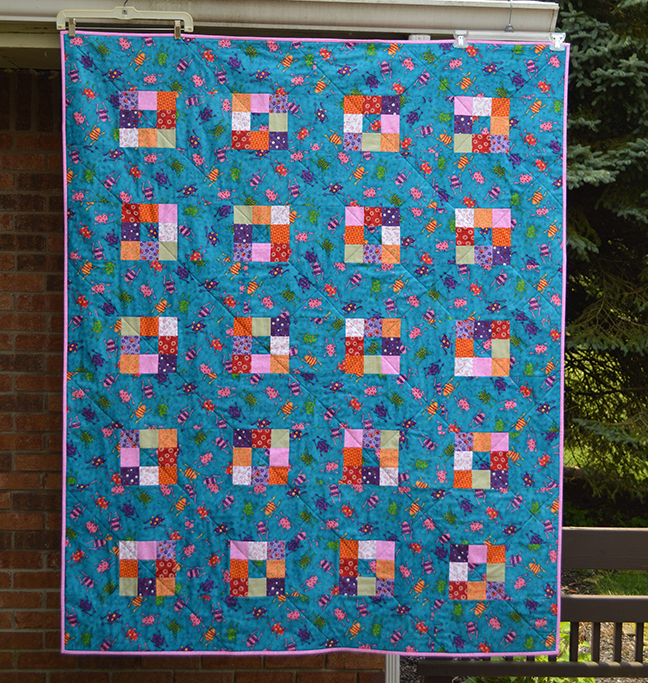 Oh, don’t get me wrong, I looove me some plus-sign quilts, whether they appear stacked together like this one, or with each plus surrounded by a background. And I do think the individual fabrics here are quite lovely on their own. But I had my doubts about this project from the start, and that definitely wasn’t a good sign. The problem is, my taste has just changed too much since I bought this fabric more than a decade ago. 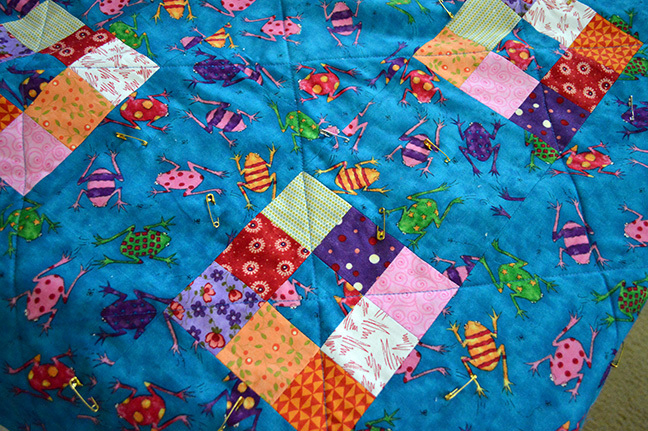 With no solids to give the eye a rest, the quilt is too busy for me, and I’m tired of the jewel-toned color scheme. My style now is much more contemporary, bold and graphic, but you’d never know that looking at this quilt. In fact, I’m not sure you could tell that about most of what I’ve made and posted here. In the past year, as I’ve dealt with moving to a new state, starting a new job, selling two houses and buying another, and getting involved in other activities, I’ve given a lot of thought to how I want to use the limited time and interest I have in making things. From now on, unless I really love the fabric/yarn/pattern/floss/combination/etc., I’m not going to make it, even if it means selling, donating or throwing things away mid-project. The rest of my life is too short to spend time on things I no longer like just because I once invested time and money in them or because I could donate the finished project. I’d rather let go of the supplies now and let someone else have the enjoyment of making something they love. The other truth is, I really don’t need all this stuff. Of course, mistakes happen and directions change, but the biggest lesson I’ve learned here is to trust my instincts and when in doubt — don’t. Have you seen the rolls of reusable unpaper towels on Pinterest or Etsy? They’re a great way to help protect the environment by not using paper, and you can show off some cute fabric. Over time, this eco-friendly version will probably turn out to be cheaper than the tree-made variety with their continued use, as long as you don’t try and scrub a grill grate or other rough surface with them. 1 1/8 yds. quilting cotton or flannel (If you use flannel, you may need a little more since it shrinks more than quilting cotton.) You can do all the same fabric, use one of each from your favorite collection or mix it up with a patchwork version. 48 sets of plastic snaps (24 male, 24 female) I used Kamsnaps, a wonderful company that uses proceeds from their sales to help rescue animals. You can even get the snaps in fun shapes like flowers or hearts. Start by pre-washing ALL your fabric in hot water with a color-catcher, if necessary. 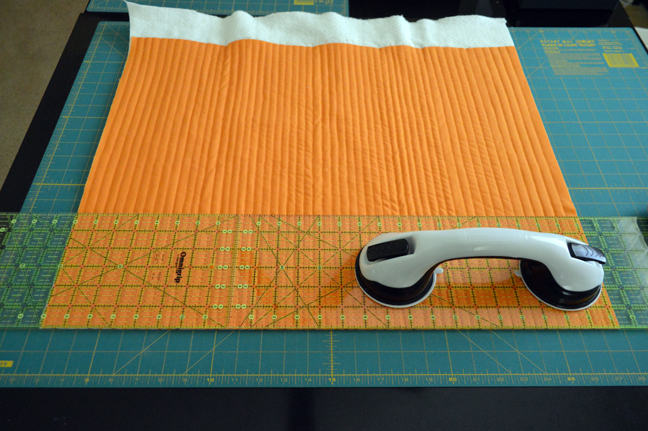 This is absolutely essential if you want your towels to stay flat and nice looking. Quilting cotton and terrycloth shrink at different rates, and pre-washing helps keep them the same size in subsequent washings. It also removes any sizing chemicals used by the manufacturer. 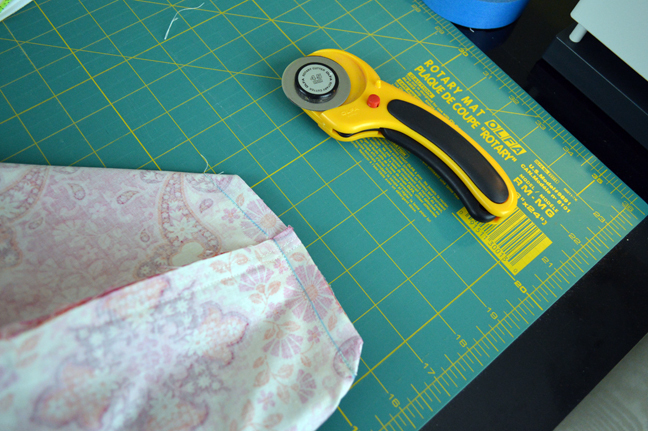 I like to serge the cut edges of my fabric so I don’t wind up with a tangled mess of threads to cut off. I put the blade down first so I don’t cut the fabric by mistake. 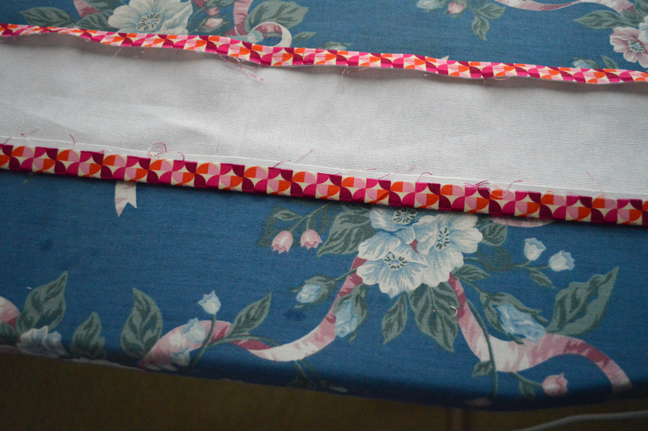 Next, iron both sets of fabrics as smoothly as possible. You can use spray starch if you think it helps your cutting accuracy; I didn’t bother. These towels are going to clean up spills and messes, so it’s not a time to worry about perfection. Starting with the quilting cotton, fold the fabric in half, lining up the selvages; trim them as close to the selvage edge as possible. 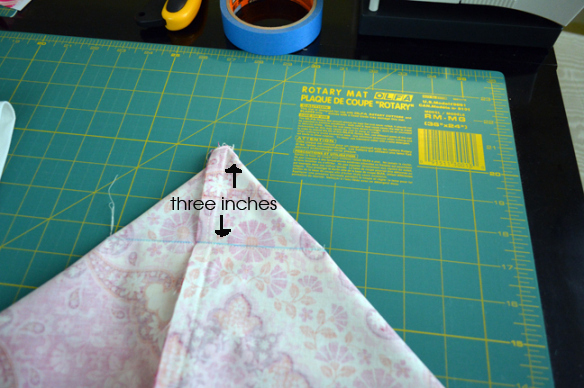 Then trim the cut-side edges so that you have 1 yard of fabric. 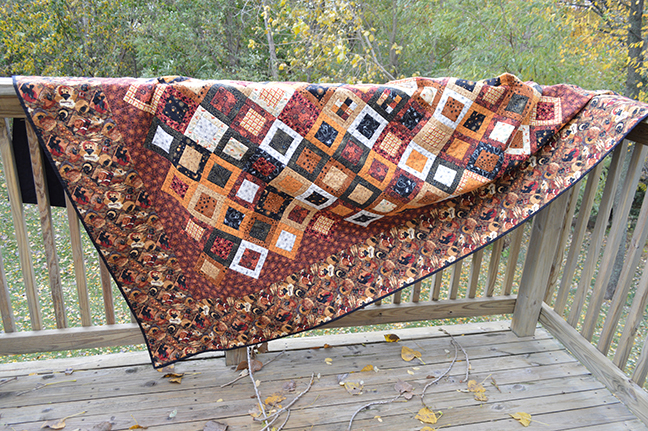 Subdivide and cut both sets of fabric into 12 12-inch squares. Be prepared for all the terry fuzz that will go flying all over your cutting surface. Note: A standard American paper towel is an 11-inch square, and while some quilting cotton is 45 inches, allowing you to get 12 12-inch squares from a yard, a lot of it is only 42 or 43 inches, especially once you cut the selvages. You can either cut 12 equal pieces, which is what I’d recommend, or make scrappy versions with the leftovers. That’s easy to do with the quilting cotton, but the terrycloth? Not so much. (Don’t ask me why I know this.) I say close to size is good enough. The important thing is to have the cotton and the terry match in size, but even with that you can fudge a bit since the terry stretches. Place one square of the quilting cotton, right-side down, on top of a square of the terrycloth. Pin like crazy to help reduce any shifting while sewing. Mark the spot for an opening on one side that’s large enough for your hand to fit in. Stitch all the way around the edges using a 1/4-inch seam allowance. Reinforce the starting and stopping points with a few back stitches as shown at the top of the photo below. 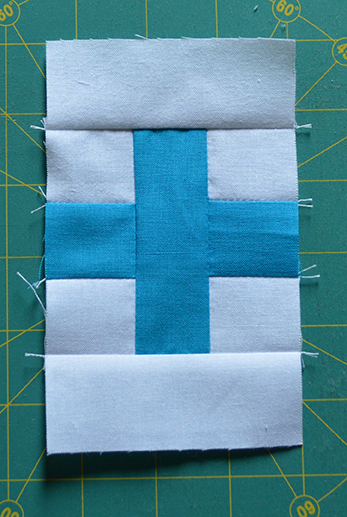 Clip the corners and any excess terry that stretched/shifted while stitching. After you’ve made all 12 towels, it’s time to install the snaps. The Kamsnaps website has video if you need help, but it’s pretty easy. 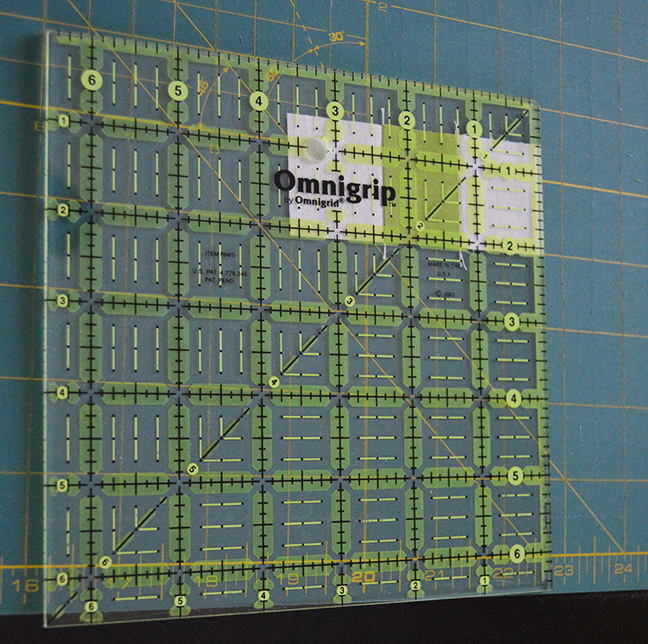 On the top, using a water-soluble pen, mark a spot in each corner that’s 1-inch from the edge on both sides. If you’ve used different fabrics and care about the order they’ll come off the roll, now is the time to arrange them in the order you prefer. Take the awl and poke a hole through all the layers in either the top or bottom mark on the far edge (the one that comes off the roll first), then place the masculine side of the snap through the hole, with the rounded flat side on the quilting cotton side. Place a masculine cap on the terrycloth side and slide the rounded flat side into the plier base. When everything’s aligned, give it a good squeeze to set the snap. Place another masculine snap in the spot directly above or below the first snap (not diagonally across). If your fabric has a direction, pay attention to which side you place the snaps, since they need to be all in the same direction to work. On the opposite side, place a feminine snap in each of the remaining spots, also with the flat edge on top. For your second towel, install four more sets, this time putting the rounded flat cap on the terrycloth side in all four places. Make sure your feminine side snaps are on the edge that connects to the masculine side on the first towel, so you’ll be able to snap them together. How I managed to get all the right snaps on in the correct places on all my towels without a single mistake, I’ll never know. Here’s a look at the masculine side snap all installed. Snap your towels together and roll them onto an empty paper towel roll. Then stand back and admire your work! These towels aren’t as cheap as a roll of paper towels, to be sure, but they are a whole lot cuter. It did take me a few days to work up the nerve to use them, but now I can’t imagine using anything else. I only use the paper version for things like toilets or something that would stain badly. Speaking of stains, when I wipe up a food spill, I rinse the towel out immediately and then use a little dish soap, rubbing till the stain is as out as I can get it. I then wring it dry with my hands and let it air dry or throw it in the laundry basket, depending on how dirty it was. I know my set won’t stay bright white for long, but I’m OK with that. I made a jumbo roll of 18 towels, and with rinsing/air drying, I haven’t gotten to the end of the roll yet. When they get too gross to use, out they’ll go and I’ll make new ones. *A note about terrycloth. I made most of my set using terrycloth yardage. It’s thinner than the terry found on bath towels and a lot easier to cut with a rotary cutter. I did use some less than new hand towels on a few of these and would do so again rather than throw the towel away. However, there is a lot of waste with the regular towel, so bear that in mind before you cut. Have fun making a set of these. I have a feeling they’ll be pretty addicting. With the move I made a few weeks ago, it’ll be awhile before I get back to any stitching, but I wanted to give a shout-out to my friend Stephanie at Late Night Quilter for the new 2016 planner she’s created just for quilters. 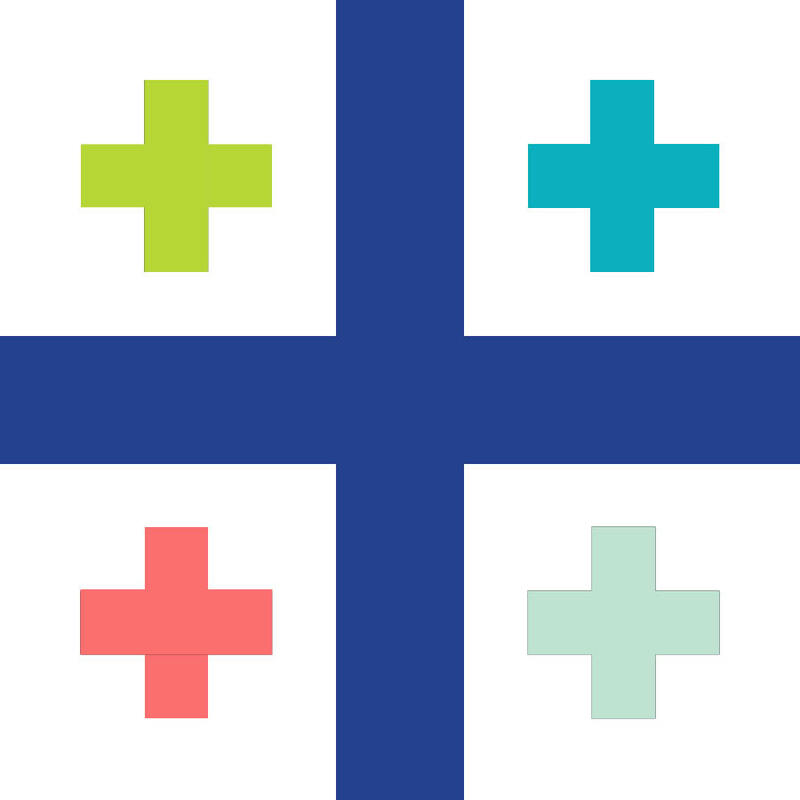 It’s a fabulous one-stop-spot to organize your life and creative projects, all in one place. 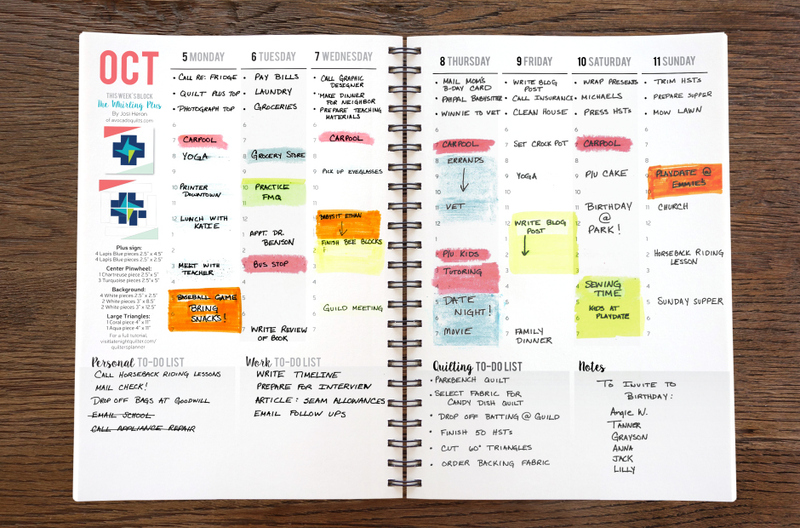 I love the free space at the bottom to include notes, doodles, whatever! 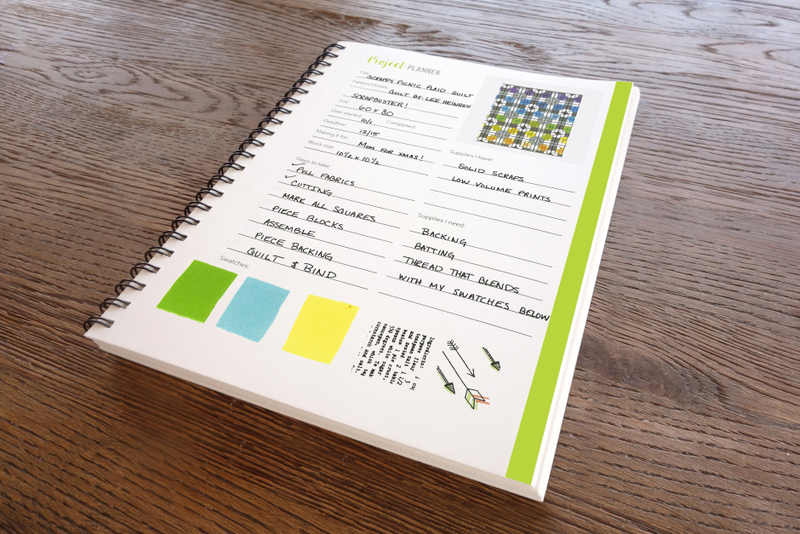 Track all the steps you need to take to complete the project, and list your supplies, including the ones you need. Attach an inspirational picture or sketch a block design; you can even attach swatches of fabric with included sticky dots. She’s also included a swatch saver, graph paper, free-motion quilting practice pages to develop muscle memory and goal-setting prompts. 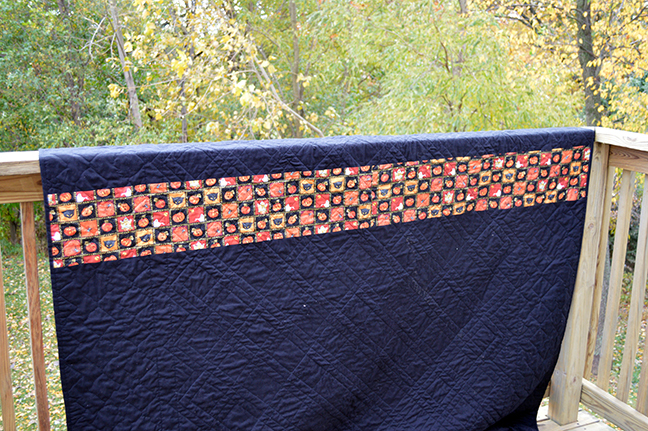 If that’s not enough, there are eight full quilt patterns from well-known designers: Cheryl Brickey (Meadowmist Designs), Yvonne Fuchs (Quilting Jetgirl), Amy Garro (13 Spools), Lee Heinrich (Freshly Pieced), Mandy Leins (Mandalei Quilts), Pat Sloan (Pat Sloan), Kitty Wilkin (Night Quilter) and Stephanie herself (Late Night Quilter). To keep you inspired, there’s gorgeous artwork pull-outs by the talented Kelsey Boes from Lovely and Enough and a reference section for quilting calculations and common construction techniques. You can order your planner during the pre-order campaign at Indiegogo until Nov. 30. There, you can watch an incredible video about the project, see more photos and read a lot more details. The planners will ship in December and should arrive in time for holiday gift giving with a 95 percent guarantee. With everything going on for both printers and shippers, Stephanie wisely advises the planner might arrive in January, so that’s why it’s not 100 percent a sure thing. 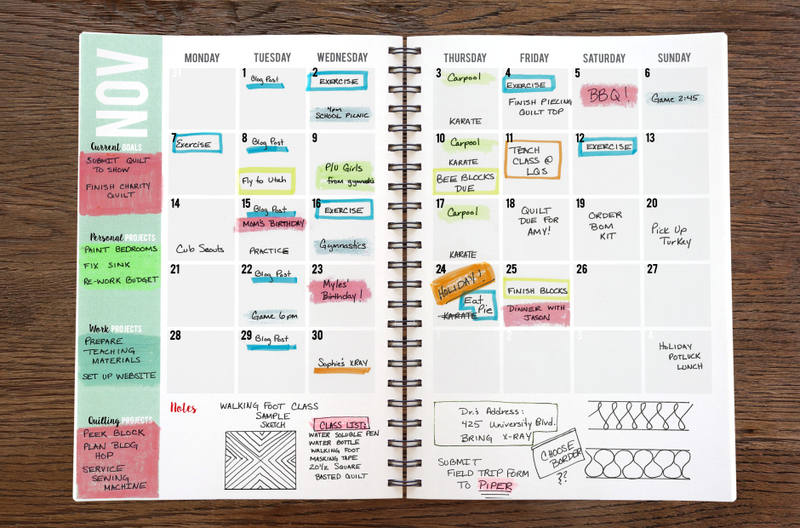 I am so proud of my friend for doing all this, and I know the planner will be a great addition to anyone who loves quilting and needs a little help organizing their life. And seriously, isn’t that pretty much all of us? ** I receive no compensation for this post or for the block I designed. I’ve paid for my own planner, and the opinions here are mine. Photos are used with permission. 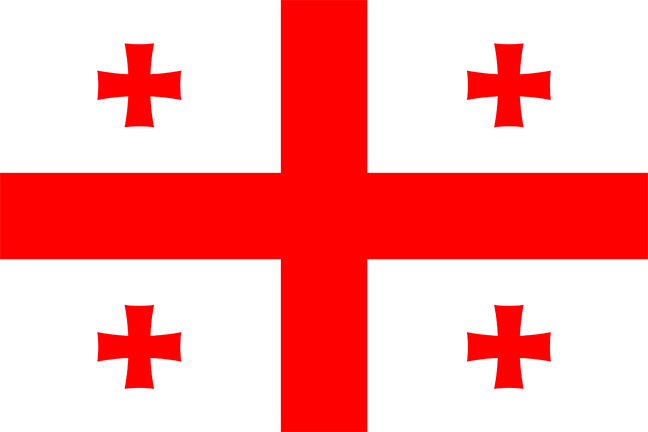 A lot has been going on over here in the past few months, namely that I moved to a different state for a new day job. 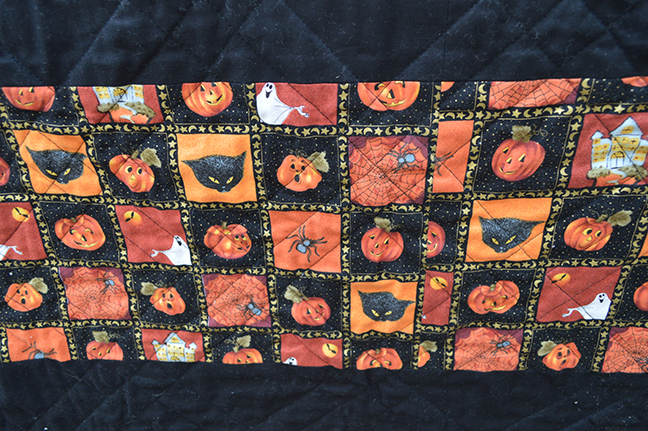 It’s all very exciting, and I’ll tell you more about it at a later date, but since today is Halloween, I wanted to share my finished Halloween quilt. 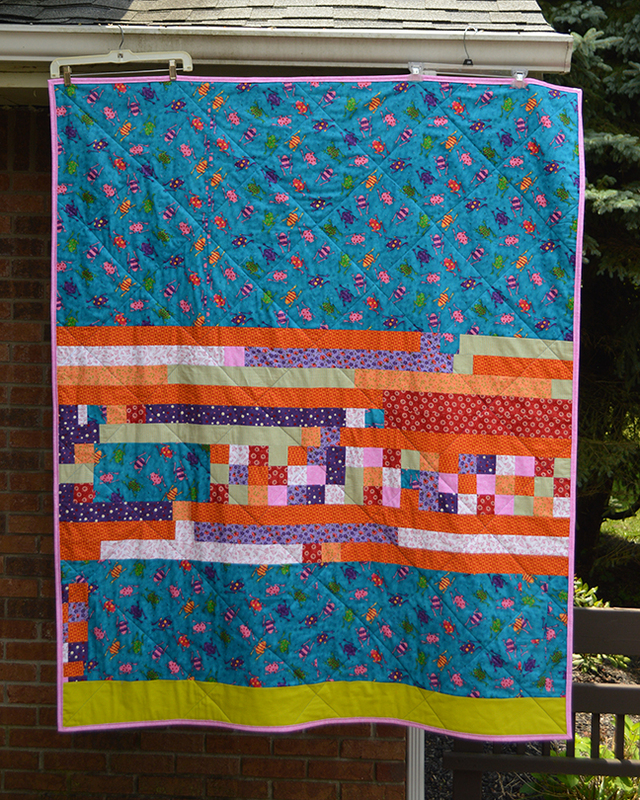 When I started this quilt, I hadn’t yet become interested in modern quilting the way I am now. As I thought about the quilting, I seriously considered removing the border to make it more modern, but I didn’t want that fabric on the back since it was the one I loved most. Moving forward, I started quilting by stitching in the ditch around the on-point squares (three-inches finished with a one-inch finished border for those of you playing at home), and stopped in the middle last year at this time when I was two-thirds of the way through. I took it up this spring and debated ripping again, but decided I would rather get it finished than take out what I’d already done. To be honest, I’m not really crazy with the front. Oh, I still love the fabrics, but the top just isn’t modern enough for me. When I finished hand-stitching the binding, I even thought of ripping it all out, cutting the border into the three-inch squares and setting the entire quilt on point. There would be lots of great opportunities for fussy-cutting. I even have enough of the setting triangles left over to do that, and I’d probably make the quilt a little less rectangular in shape. Right now, it’s a twin size at approx. 72×90 inches, but I think I’d add one extra row to the width, depending on how many squares I got from the border. Now that I’ve used the quilt for awhile on my bed folded like a runner, I’m bothered a little less by the front. 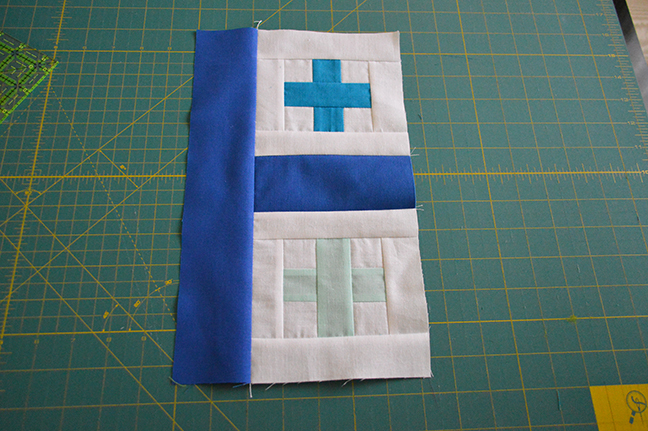 Also, with so many other quilts to make and/or finish, do I really want to spend the time redoing this one? Probably not. This Halloween fabric didn’t have the vintage vibe of the rest, so it was perfect for a modern back with lots of negative space. When I’m feeling modern, I fold it to the back side. Other days, like today, I show off the front. Excuse me, is anybody still out there? I know, I’ve been gone awhile. Truth is, I lost my blogging mojo. Seems like a lot of other bloggers have too. It’s modern life, right? We’re all a little too busy and stressed, no matter what our station is. And since blogging isn’t my full-time gig, it’s all too often the first thing to go when I’m feeling overwhelmed. So, to return (hopefully) to a more regular schedule, I’ve got a tutorial for you, one that’s quick and easy, takes advantage of pre-cuts or die-cuts, and is perfect for a gift or to donate to a deserving charity. 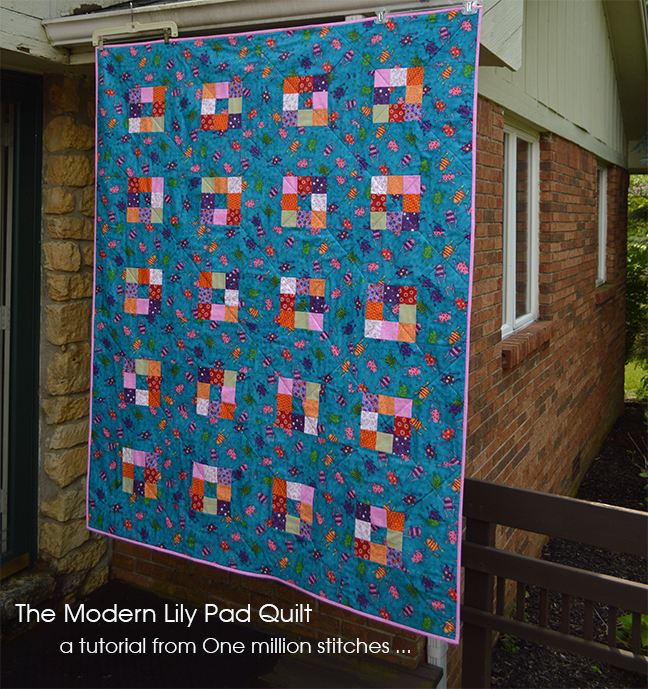 I’m calling it the Modern Lily Pad quilt, and you can customize it however you’d like. Finishing at 54×66 inches, it’s a nice lap size. Inspiration/background fabric: 2 1/2 yds. (based on at least 42-inch width). 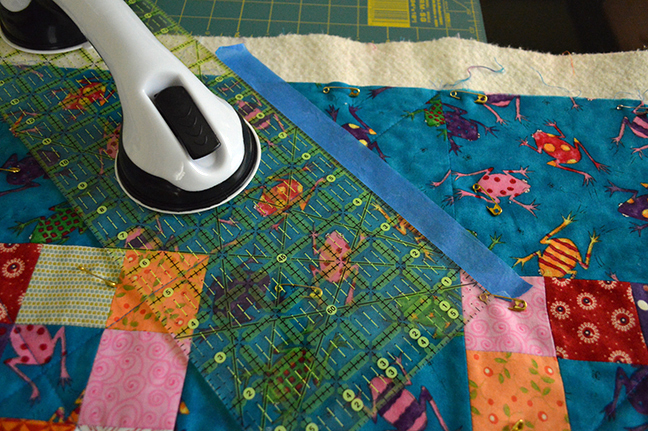 Binding: 1/2 yard or use any leftover strips from your lily pad pieces for a scrappy look. Start by cutting 5 (6 1/2-inch) WOF (width-of-fabric) strips; then sub-cut those into 25 (6 1/2-inch) squares for the lily pad rows. 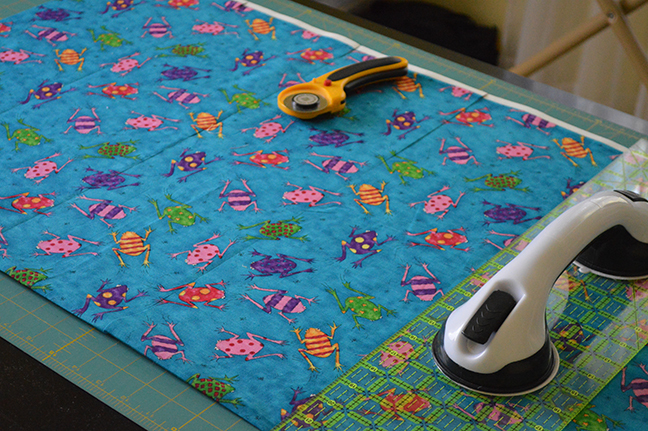 Use the leftover fabric on the last strip to cut 20 (2 1/2-inch) squares for the centers of your lily pad. 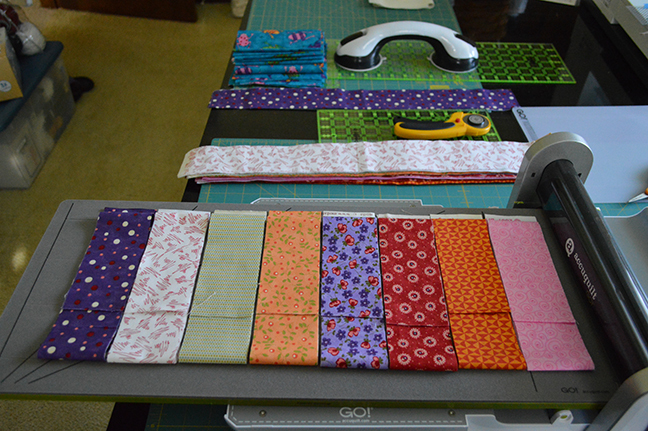 Next cut 6 (6 1/2-inch) strips down the length of the remaining fabric for the sashing rows. If your fabric is directional, or you don’t like cutting lengthwise (like me) you can cut 8 (6 1/2-inch) strips across the WOF and then piece those rows. The two additional rows divided into thirds will be enough to piece. 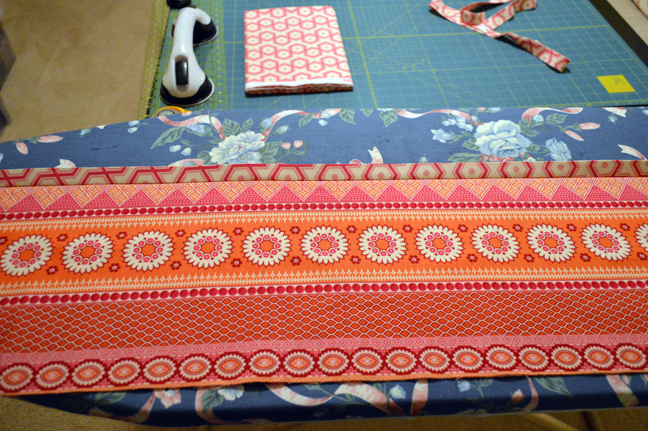 Once you’re done you should have 6 rows that measure 6 1/2-inches wide by 54 1/2-inches long. Be sure to pay attention to directional fabrics when you cut. There are 20 lily pad blocks, so you’ll need 20 (2 1/2-inch) squares of eight different fabrics if you want each block to look the same. 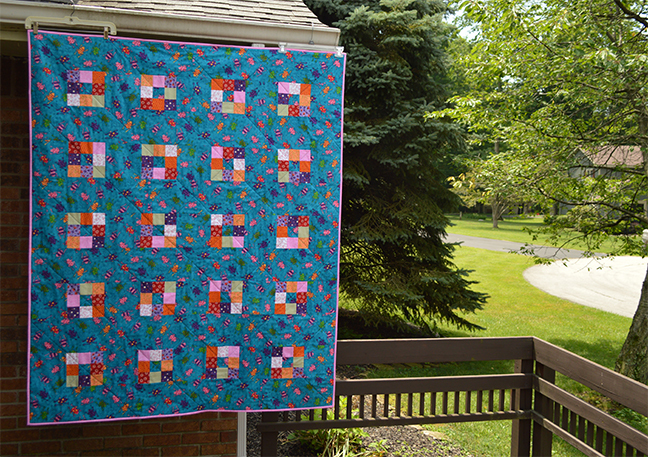 If you want to go even more scrappy, you’ll need a total of 160 (2 1/2-inch) squares. 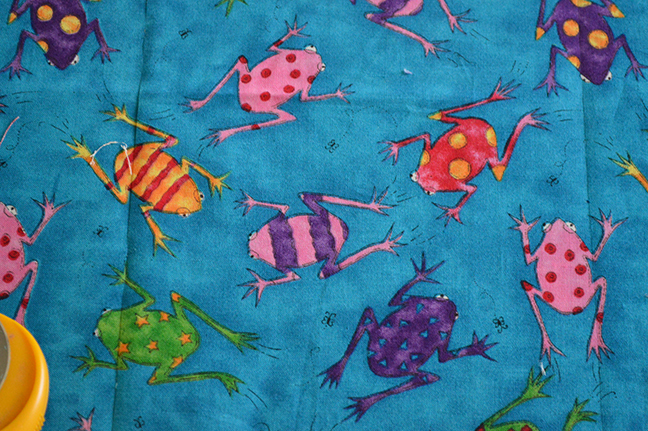 I began with this cute frog fabric that I’ve had in my stash for far too long. 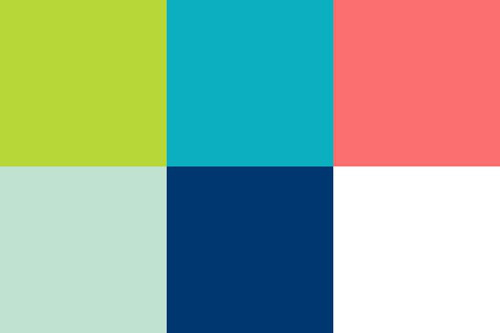 I loved the bright colors and knew it would be perfect to help me choose my additional fabrics. 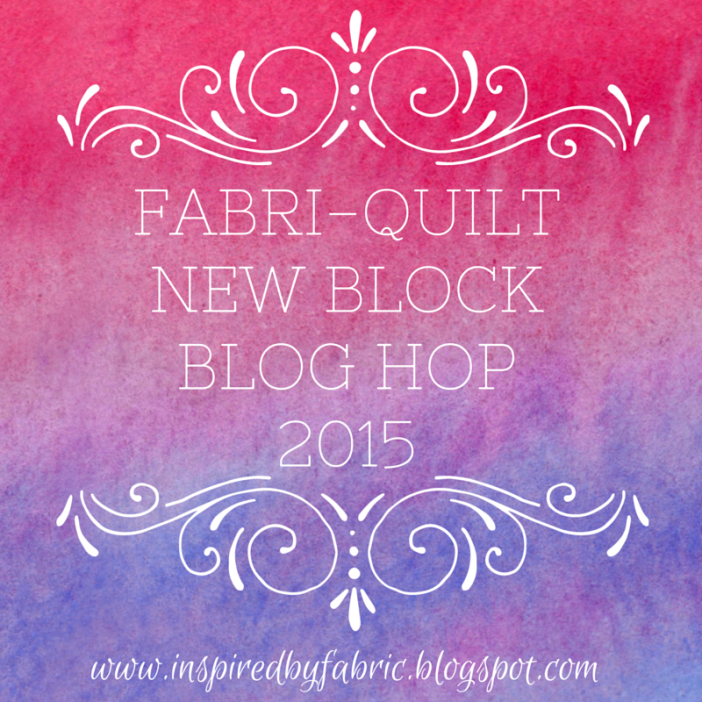 I chose the same eight fabrics for each block and used my Accuquilt Go! Cutter to cut them into 2.5-inch strips. 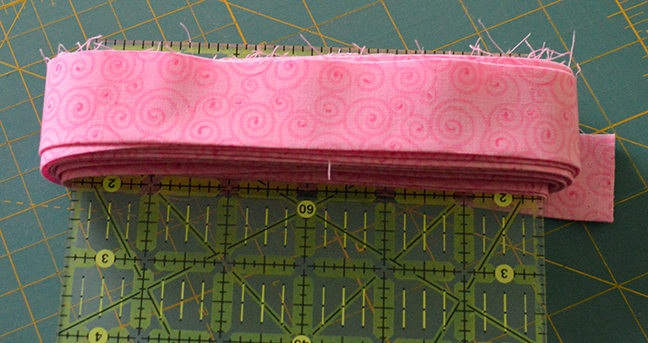 Next, using the same die cut, I cross-cut my strips into 2.5-inch squares. So easy! 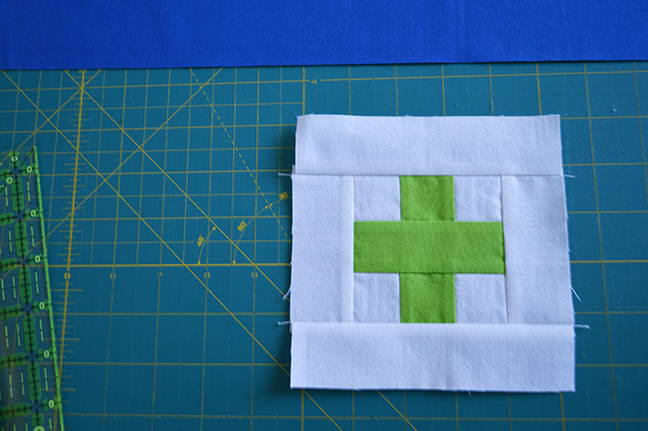 To make the blocks, I started by sewing three squares together using a 1/4-inch seam to make a row, then sewed three rows together. 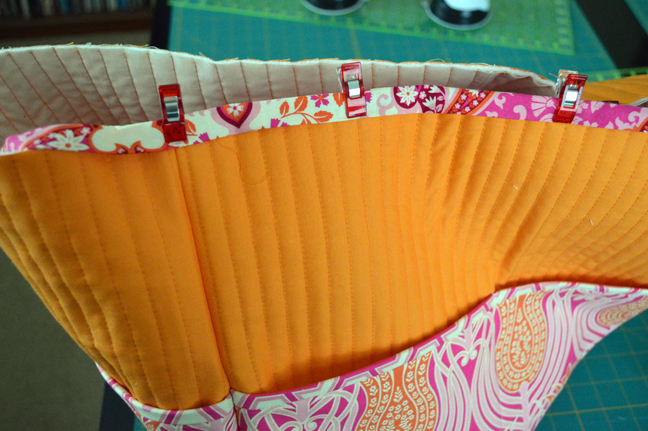 I pressed my seams open, but you could press to the side (alternating sides and couching seams) if you prefer. 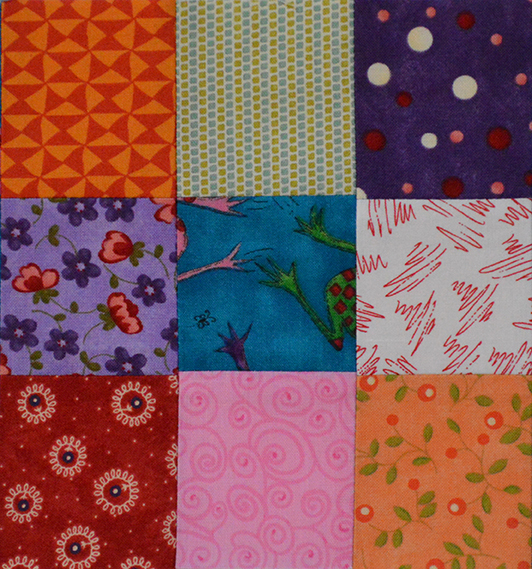 Each block had one square each of my eight fabrics; the middle was the background fabric. I also varied the placement of the fabrics. 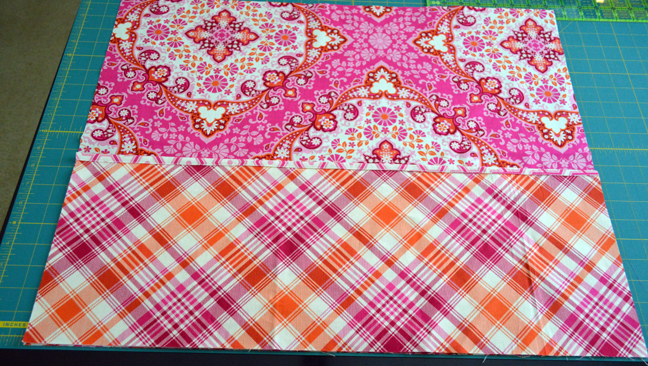 Here’s an example with a finished block: Tip: I could have taken a photo of my design wall to remember my order, but since I forgot, instead I worked row-by-row, going from left to right, always putting the second piece on top of the first and sewing a scant 1/4-inch seam. 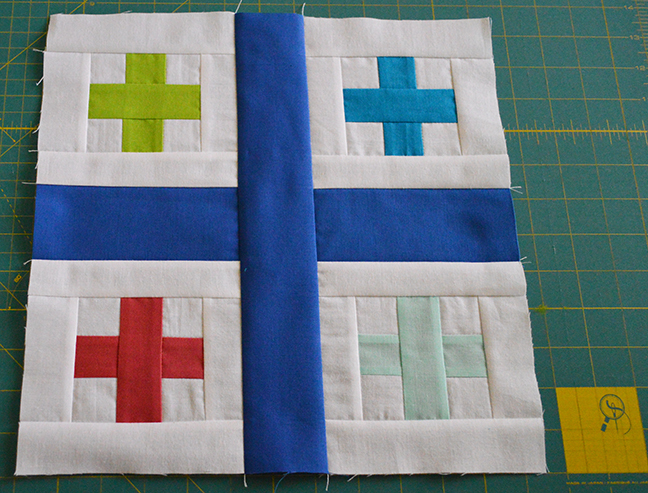 I chain pieced the three rows keeping them in order and then went back and added the third square to each row. You also don’t have to be that fussy about it. I just wanted a scrappy look. 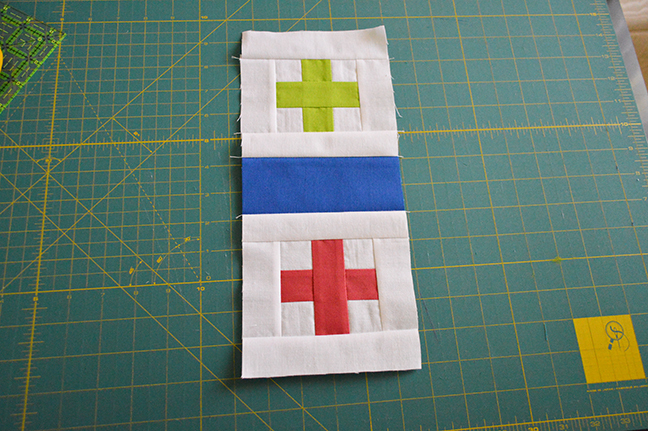 It’s really up to you how how the nine-patch blocks look; just make sure to keep your inspiration fabric in the center. Otherwise, have fun and don’t worry too much about where the remaining fabrics go. 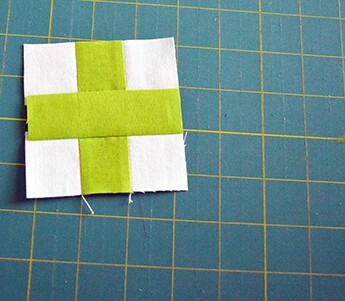 Tip: for a cute idea, you could fussy-cut the center squares, something I might do the next time I make this! 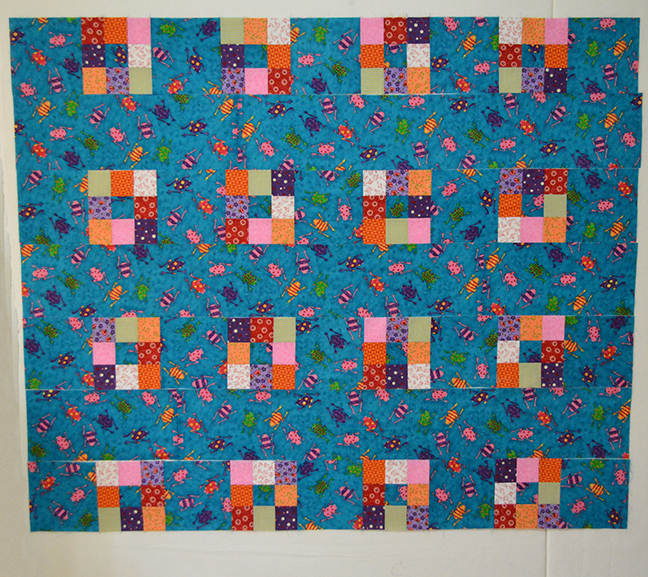 After you make all 20 nine-patch blocks, sew one nine-patch block to one of the 6 1/2-inch squares of background fabric. After I did this, I put them up on my design wall to see where I wanted each block to go. Essentially, these work the same as when you tape the back/batting, etc., but stay much more secure. They come in a package of 14 in assorted sizes. I bought mine from Amazon, who doesn’t seem to carry them anymore, but you can buy them from Sears. Well worth the investment. For the quilting, I was going to do a simple stipple all over, but my machine’s tension was badly off and multiple attempts to fix it didn’t work. Thankfully, it still makes a good straight stitch, so I opted instead to do a wide cross hatch. 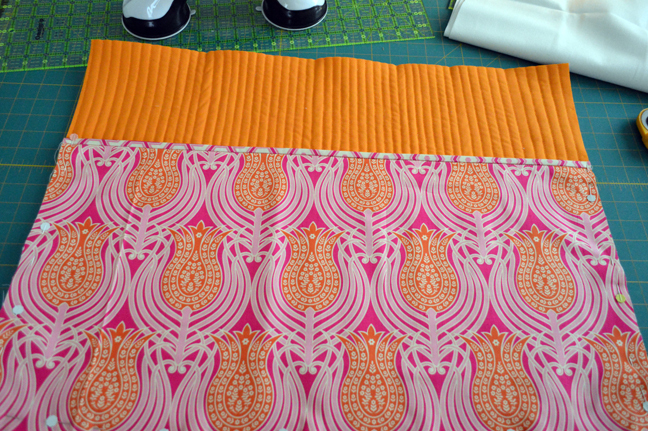 The key thing on this type of quilting is to start and end well. I first started by using painter’s tape, after lining up my ruler on the 45-degree line along the top of the nine-patch blocks. It helps to decide if you’re a righty or a lefty when placing the tape, though that can change in order to not have so much bulk under the machine. The problem with this method is the tape doesn’t always stick too well, especially after multiple uses. I found the Hera marker to work much better. Ok, I have a confession to make here. I didn’t mark the lines all the way through. When it came to the blocks, it was pretty easy to line up to the next point on the diagonal. The 6-inch space between blocks was a little tougher, but I have a pretty good sense of alignment on these things and it seemed to work out. If that bothers the perfectionist in you, by all means, mark all the way through. But as you can see below, the stitching is nicely aligned and not marked saved me a lot of time. In fact, I found I did better going by eyesight than by the marked line. 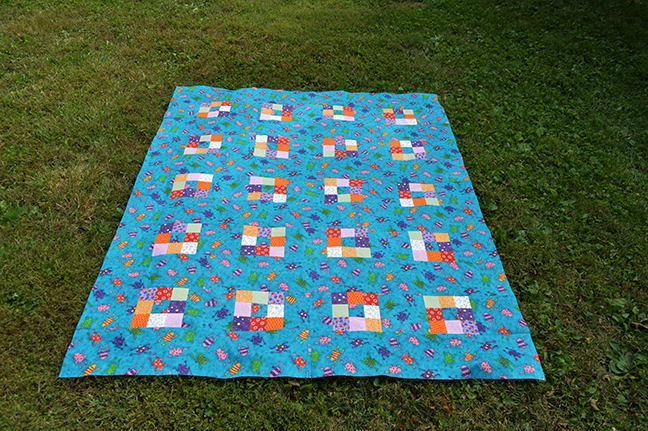 When you’ve finished quilting, trim the excess batting and backing from your quilt, squaring it up as you go. A large square ruler placed in the corner is a handy way to do this. 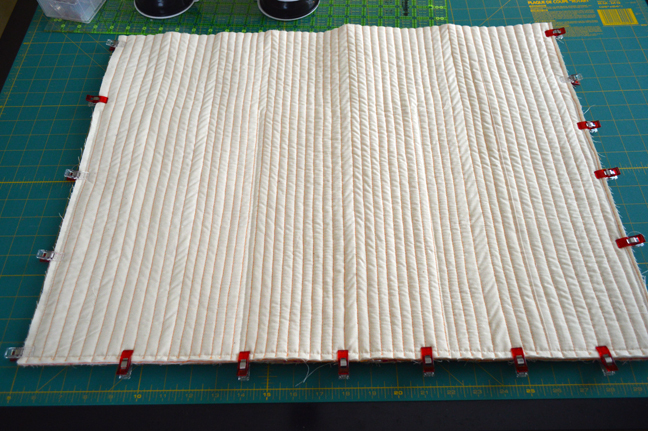 Another confession: I do trim my quilts before binding them, but I don’t worry if they’re not perfectly square, especially if it means cutting off too much to get it even. 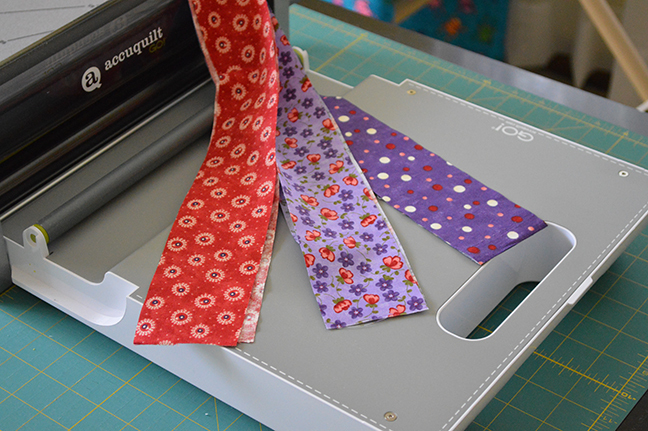 For the binding, cut 6 (2 1/2-inch) strips of your binding fabric. Seam them together (either with straight or bias seams) to make one long continuous strip, at least 250 inches in length. 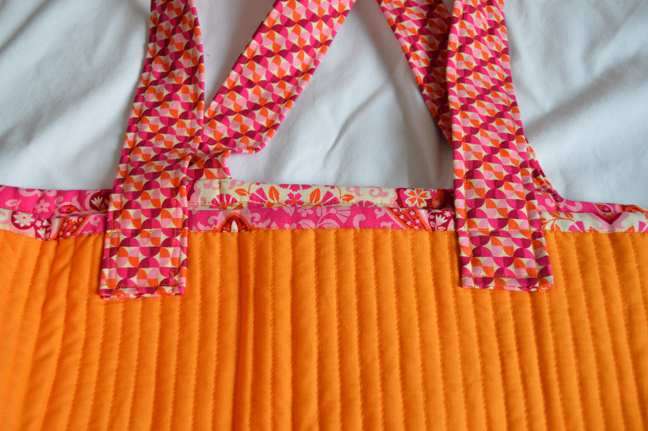 I sewed mine with straight seams, which you can see on my tutorial for an easy fleece blanket, but you can see how to sew them on the bias here. 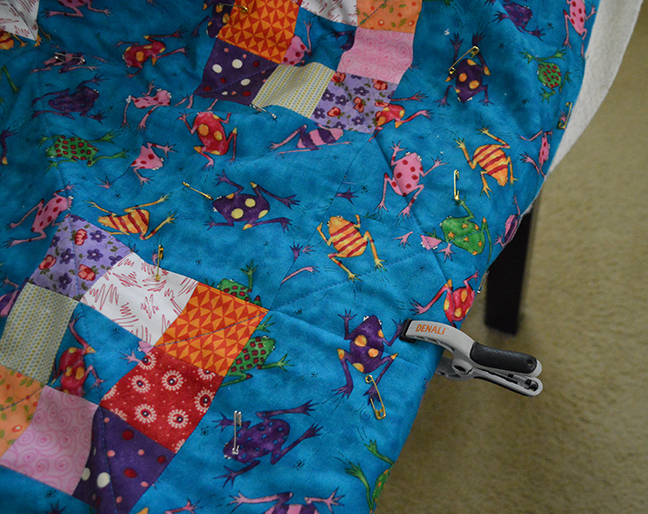 You can also see how to attach it to your quilt (both front and back). I like to attach mine starting at the bottom. 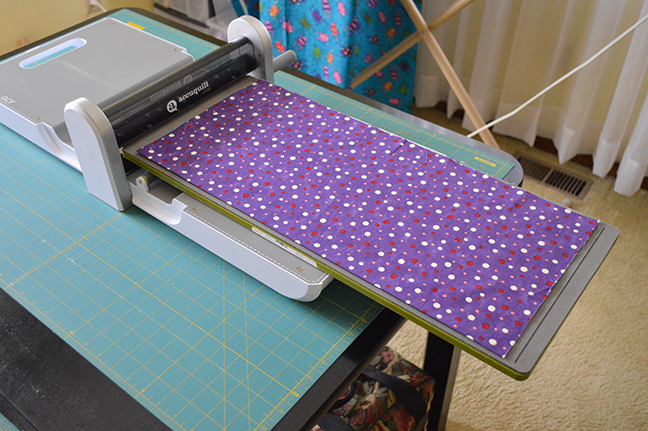 Tip: Once you have your binding made, you can wrap it around a ruler that’s not in use and slide it off to keep it untangled until you’re ready to put it on your quilt. 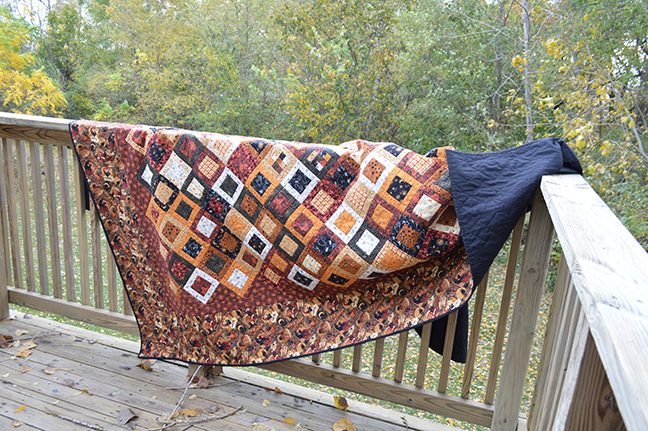 Attach the binding, throw it in the machine for a wash/dry (many charities will only accept washed quilts; I wash mine using Dreft baby soap) and you’ve got a great quilt for a deserving someone. That person might even be you! 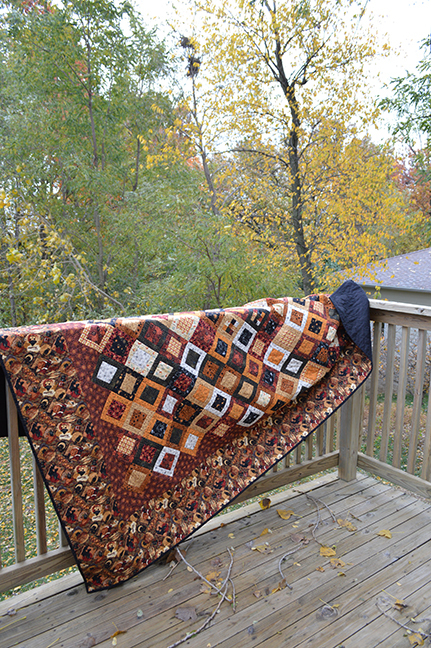 Linking up with Amanda Jean at Crazy Mom Quilts for Finish it up Friday.